Daniel Dickinson is a member of a burgeoning generation of contemporary jazz practitioners whose enthusiasm is contagious and imaginative phrasing on the saxophone rouses audiences’ attention. His latest offering, A Gathering Foretold, is a collaborative effort between Dickinson and his fellow band mates. Their contemporary sensibilities are evident in the fluency of their exchanges and nimbleness of their banter. The audience is chiefly a spectator, observing the kinetic activity being exercised among the performers. Several numbers resemble a jam session-style exercise, including “Exodus” and “Noumenal World,” as Joshua Bowlus’ doodles on the piano intermingle with the crescendos of the horns comprised of Dickinson’s sax, Michael Dease’s trombone, Mercedes Beckman’s baritone sax, Alphonso Horne’s trumpet, and Juan Rollan’s tenor sax. The rhythm section of Reuben Rogers’ acoustic bass and Ulysses Owens, Jr.’s drums keep the tempo at a frolicking pace. The dynamic exchanges invite audiences to experience the group’s vigor and animated movements, as band members exert an unadulterated nimbleness that is youthful in spirit and kindred in nature. The musicians’ rapport show a compatible connection in “Redemption,” as the improvised phrasing of Barry Green’s guitar is interlaced with the freestyle meandering of the horns. 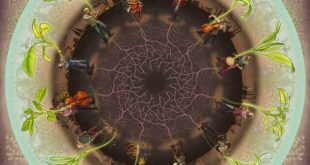 The musicians reach out to one another in the title track, co-mingling and socializing on a melodic plane. Audiences can appreciate their banter on an aural level. “Voyage to Somewhere” and “Darn That Dream” exude a soothing aura as the mellow tones of the piano and horns create a balmy atmosphere. The pleasing aesthetics of both are designed for audiences’ enjoyment. Daniel Dickinson is a newcomer to the music scene, though he plays with the instincts of a seasoned performer and the nimbleness of an astute artist who knows his craft inside and out. His choice of band mates proved to be compatible with his liking for improvised music, showing a fondness for contemporary jazz that they share with audiences. Shifting Borders is a cocktail that embraces the music of multiple cultures and merges them together into a melodic brew.